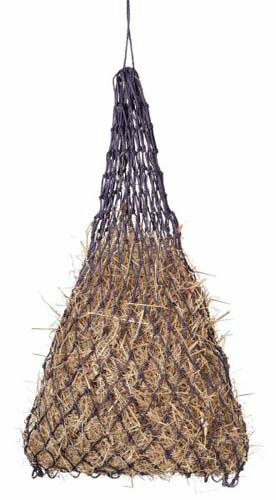 Tough-1(R) Slow Feed Hay Bag Large 40" size holds plenty of hay to keep your horse busy at the show, campground, or trailer. Made of the strongest Challenger poly hay cord for longest wear. Knotted style has 2" square holes to make your horse eat slower and make less mess. Features: Durable - Made of the strongest Challenger poly hay cord 2" square holes to make your horse eat slower and make less mess Item Specifications: Size: 40"